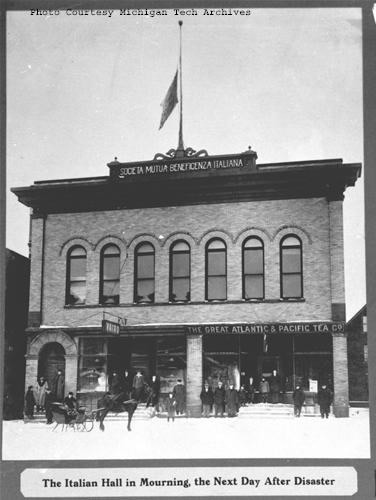 The Italian Hall was a two-story building constructed for the Italian Benevolent Society. The first floor had two businesses: Vairo’s saloon and the Great Atlantic & Pacific Tea Co. The second floor had a large meeting hall. The Italian Renaissance Revival-style brick building was distinguished by a row of round-arched windows across the façade. The prominent cornice bore the name of the society that owned the building. The first floor had two store fronts and, on the far left, a sandstone arched entrance leading to the stairway to the second floor. Hunts’ Guide to Michigan’s UPPER PENINSULA, 26 February 1997, Hunts-upguide, 15 April 2006.